Διάλεξη: «Ένταξη μουσείων σε ιστορικά κτίρια: από το αυτονόητο στο προβληματικό», 19/12/2012, 19:30. This conference brings together university researchers, professionals and policy makers to illustrate and discuss the most pressing issues concerning the conservation of archaeological, architectural and urban landscapes. In particular, the main goal of the conference is to discuss multi-disciplinary researches on complex Cultural Heritage sites, ranging from archaeological ruins, historical architecture and centres. In the framework of the 150th Anniversary of the foundation of the Politecnico di Milano, of Centre for the Conservation and Promotion of Cultural Heritage organizes an international Conference to discuss new frontiers about the conservation and enhancement of Built Heritage. This conference brings together university researchers, professionals and policy makers to illustrate and discuss the most pressing issues concerning the conservation of archaeological, architectural and urban landscapes. In particular, the main goal of the conference is to discuss multi-disciplinary researches on complex Cultural Heritage sites, ranging from archaeological ruins, historical architecture and centres. General and thematic discussions on architectural and archaeological Heritage are both encouraged, by taking into account the different points of view of researchers who are engaged in the enhancement of knowledge and practice, and professionals in charge of safeguarding. Keynote speakers will present case studies representative of challenges and solutions adopted for the analysis, conservation and management of sites. • development of guidelines and best practices. The official language of the Conference, for both oral and written contributions will be English. Papers about the main topics of the Conference are welcome. A 500 word abstract should be submitted by 15.03.2013. 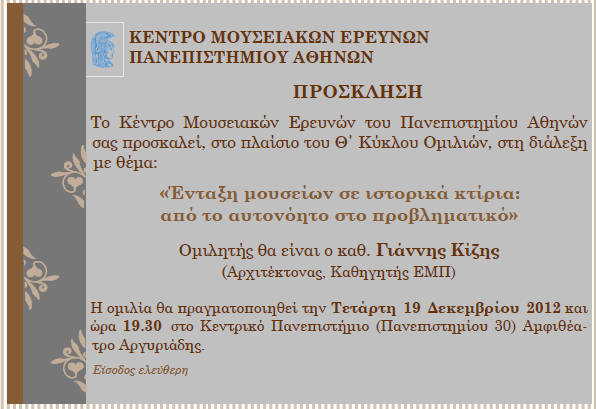 Selected papers will be accepted as oral or poster presentations by 15.04.2013. The accepted papers will be included in the online Conference Proceedings, for which a 4-8 page contribution should be submitted by the 15.07.2013. Full papers for the Postprint volume edited by Mc Graw-Hill, should be submitted soon after the Conference and will be accepted after peer review. The Postprint volume is expected in April 2014. Απευθύνεται στο Εκπαιδευτικό Προσωπικό, στους φοιτητές και σε αποφοίτους όλων των τμημάτων του ΤΕΙ Αθήνας. Στο πλαίσιο της Ημερίδας οργανώνεται τελετή βράβευσης φοιτητών του τμήματος Ηλεκτρονικής του ΤΕΙ Αθήνας οι οποίοι συνεισέφεραν επιτυχώς στη συγγραφή Καινοτόμου Λογισμικού, στα πλαίσια Ελληνικής Κοινοπραξίας για τους Δορυφόρους της ΕSA. Στην προσπάθεια υλοποίησης εκπαιδευτικού video για την ένδυση των Ορθόδοξων Λειτουργικών Ενδυμάτων στα πλαίσια του μαθήματος Ιστορία Υφάσματος του Τμήματος Προστασίας & Συντήρησης Πολιτισμικής Κληρονομιάς του ΑΤΕΙ Ιονίων Νήσων, σε συνεργασία με την Ι. Μητρόπολη Ζακύνθου & Στροφάδων, η φοιτήτρια κα. Ιλόνα Ντελιανίδου του τμήματος, δημιούργησε το παραπάνω video στα ελληνικά με αγγλικούς και ρώσικους υπότιτλους.